Do you want to boost your beauty? Prozis Hair, Skin and Nails is a multi-purpose formula with all the nutrients needed for a beautiful and healthy look. Prozis Hair, Skin & Nails – An all-in-one beauty formula. Maintaining healthy, good-looking hair, skin and nails depends on one thing alone - your diet. No matter how many expensive shampoos, serums, creams or oils you use… When it comes to boosting your beauty, nutrition is the secret. But filling up with all those essential nutrients every single day can be quite the challenging task: your weight-loss diet, your intensive training program or you on-the-run lifestyle, among other factors, can be compromising your efforts. To support your natural beauty from within, Prozis designed an all-in-one beauty supplement. Why take Prozis Hair, Skin and Nails? 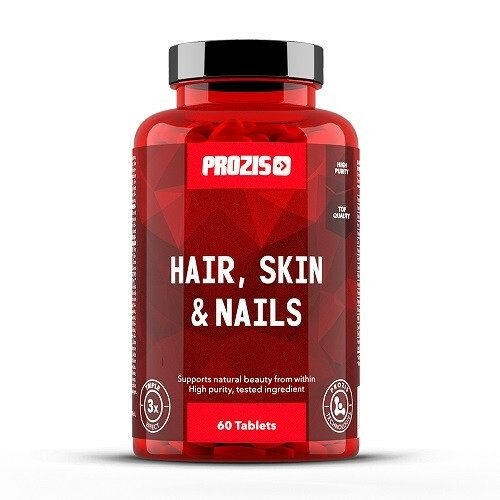 Hair, Skin and Nails by Prozis is a special herbal vitamin-and-mineral formula that provides you with the most needed nutrients for a deeper level of care. It features zinc, which is involved in the synthesis of enzymes and hormones; magnesium to support the maintenance of the metabolic function of the cells and to help keep your cartilage, joints and boneshealthy; selenium, an essential mineral that, besides promoting the normal functioning of the immune system, contributes to the maintenance of normal skin and hair; and iron which, among other crucial functions, is important to the health of hair follicles. 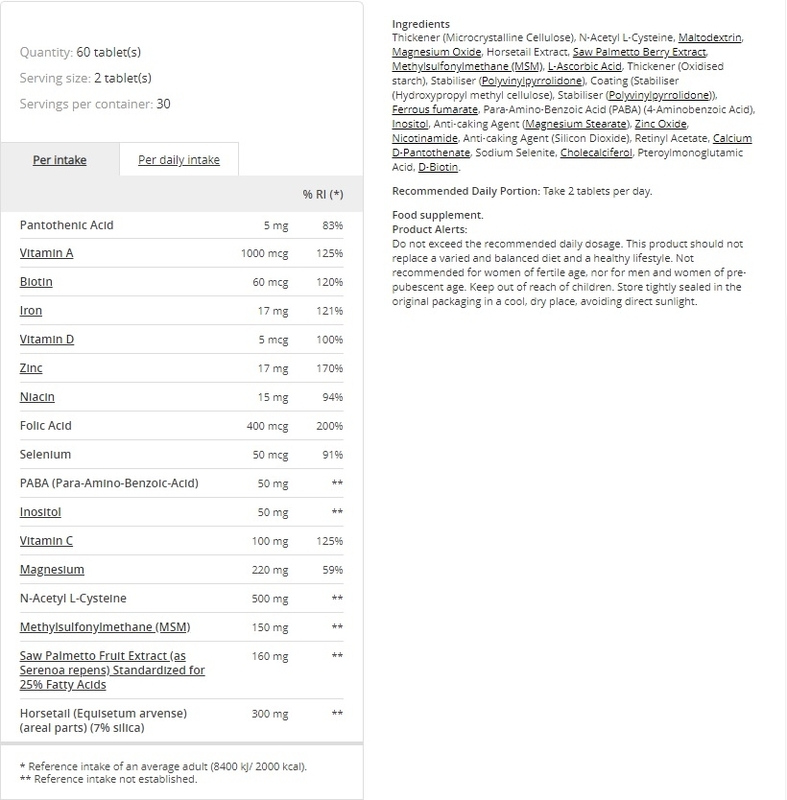 To make the product even more complete, Prozis added some crucial vitamins. Namely, vitamin A, essential to the maintenance of healthy skin; vitamin D, that is involved in the process of cell division; vitamin C, which plays a role in the formation of collagen, so important for the skin, and also helps with iron absorption; and B-complex vitamins such as folic acid and biotin, which play a role in supporting general health. Biotin in particular is well-known for its contribution to the maintenance of normal skinand hair, and is widely used as a main ingredient in several beauty products. Moreover, Prozis Hair Skin and Nails is enhanced with Saw palmetto and Horsetail extract. Saw palmettois the name given to the berries of the American dwarf palm tree. This fruit contains numerous active compounds such as fatty acids, plant sterols and flavonoids, known for their potentially antioxidant and anti-inflammatory properties. On the other hand, horsetail extract is a herb used for medicinal purposes since ancient Roman and Greek times. 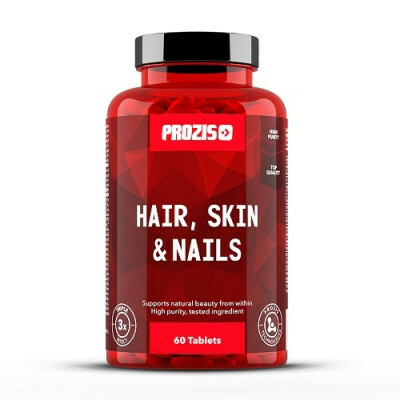 The convenient tablet form of Prozis Hair, Skin and Nails provides you with a quick and easy way to get all these precious nutrients for a beautiful and healthy look. For all these reasons, this multi-purpose supplement comes as your perfect beauty care ally.